A Dell slim-line AC/Auto/Air adapter to maximise productivity on the road. 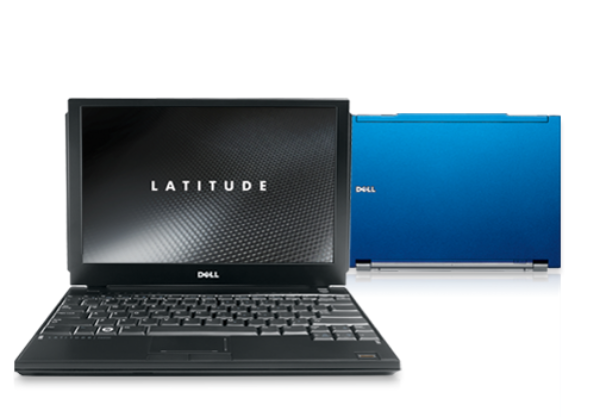 Enjoy instant access to email, calendar and internet with the new Dell Latitude ON™ communication module. Dell Latitude ON enables bi-directional remote access to your Microsoft Exchange data with the single touch of a button without booting or waking your entire laptop—lowering power consumption and extending battery life. Dell Mobile Data Protection Services* include Remote Data Delete*, Hard Drive Data Recovery* and Certified Data Destruction services*. With these optional services, Dell can remotely delete your sensitive data, prevent potential loss of valuable data, certify destruction of data or recover data from a failed hard drive without a backup. The ultimate team player, Latitude ultraportable laptops can be managed virtually anywhere in the world by your IT professionals. With image and systems management tools like Dell ImageDirect™ and Dell Client Manager, you can help simplify systems management and free up IT to focus on more strategic business challenges. Faster, more reliable support services designed to address the technology challenges you face today. This new support portfolio is focused on your needs, time demands and budgets. Need professional support services that take care of both you and your employees’ IT needs 7x24? Choose Dell ProSupport to get access to a certified technician in two minutes or less. Got an IT staff? Choose Dell ProSupport for IT and get tech-to-tech support with Fast-Track Dispatch, along with 7x24 access to Dell-certified technicians. Designed for organisations with limited or no dedicated IT staff. “How-to” support on popular software applications such as Norton AntiVirus, Microsoft Office, Microsoft Small Business Server, Intuit QuickBooks, Adobe Photoshop and Adobe Acrobat. Designed to provide tech-to-tech support for IT Professionals, Database Administrators and internal Service Desks or helpdesks. Next, further customise your support solution by taking advantage of the Dell ProSupport Options below that align to how you use your technology. International Onsite Service* - Provides service and support for your Dell laptop while you are traveling. Dell offers custom factory integration services to help accelerate your system deployments. We can perform a range of services such as custom configuration, consolidation, and integration in our factory. For Intel® AMT and Intel® vPro™ customers, new deployment service options such as unique password pre-population; pre-configured management settings; and no-touch deployment can help ease deployment concerns while saving time and money. With Advanced Configuration Services (ACS), you can save time and resources by selecting various settings during the purchase process. You can choose to partition your hard drive; select boot order; change BIOS settings; and modify various standard software configuration settings.